Renowned architects MacDonald & Applegarth were commissioned to design several homes in this exclusive new enclave in 1910, No. 34 being the only one in the Beaux Arts style among the thirty-six custom homes built in this location. The exquisite façade at No. 34 is crowned by a continuous balustrade and an entablature composed of dentils and garland frieze work. A pair of Ionic columns at the portico entrance are balanced by classic Palladian picture windows on each side with ornate planter boxes. The residence is perfectly placed in its beautifully landscaped, formal setting. Custom lighting throughout the house makes it sparkle in the evening. 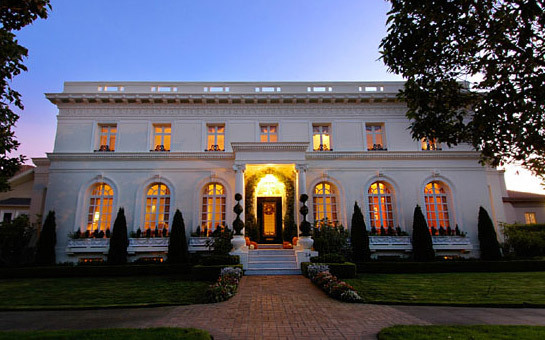 34 Presidio Terrace has been the prestigious residence of prominent San Franciscans including a senator, congressman, mayor and consul general. For its scale, the magic of this residence is in the elegant proportions of the public rooms and infusion of natural light all the day long in a lovely verdant setting. While it was built almost 100 years ago for elegant entertaining on a grand scale, this fine property retains an amazingly comfortable ambience and now features all the modern conveniences for today’s lifestyle. Enter the timelessly stylish CENTER HALL through the Palladian arched doorway. The focal point of the interior is the grand split-wing, marble staircase with skylight above. Ionic columns, pilasters and double crown moldings frame the light and airy volume. The formal step-down LIVING ROOM is an elegant space in which to entertain guests. The beautifully proportioned room is graced by double crown moldings & pilasters, Palladian windows and an ornate wood-burning fireplace with gas starter. A wet bar is conveniently built into one of the corners. The adjoining south/east facing LIBRARY is exquisitely paneled in bird’s eye maple. The handsome tall bookcases surrounding the handsome black fireplace, also of bird’s eye maple, house a major home library and display of objects d’art. The formal DINING ROOM across the center hall features Palladian floor to ceiling arched windows, beautiful crown molding and magnificent chandelier. Walls are painted in an exciting cherry red representing the owner's sense of contemporary for a stimulating mix with the traditional. The custom designed open KITCHEN includes the spacious BREAKFAST/SITTING AREA which features a handsome fireplace with granite hearth and copper cladding. It is a place to gather for drinks while food preparation is underway. The ceiling has been hand painted with a delightful trompe l’oeil skyscape which adds to the sense of whimsy of the informal part of the home. French doors open to the private, sunny PATIO/GARDEN for easy access for outdoor entertaining and children at play. This garden can be made more or less private depending on a future owners needs and wishes. Easy access to lower level, garage and caterer's entrance from the kitchen. The FAMILY/MEDIA ROOM is adjoining and is the informal heart of the house with easy open staircase to playrooms on lower level. It is a virtual ‘great room’ with abundant natural light from the expansive windows and oversized skylight. The sophisticated entertainment system houses a built-in projection screen with surround sound system; automatic blackout covers darken the room for media viewing. The designer POWDER ROOM and two guest closets complete this level. Ascend the grand staircase to the light and airy U-shaped bedroom landing with skylight and chandelier overhead. 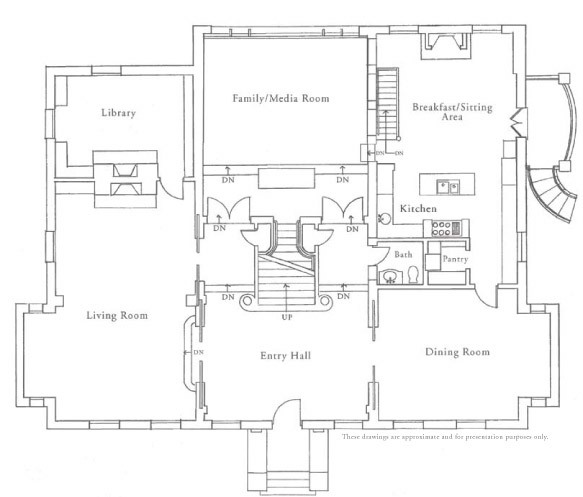 Bedrooms are arranged separately around the exceptional staircase for the perfectly functional family floor plan. The spacious morning light MASTER SUITE overlooks the greenery of the terrace; it features a wide marble clad fireplace and hearth that is, by itself, a beautiful sculpture, along with luxurious carpeting, and subtle silver leaf wall covering. The oversized dressing room with his & her walk-in closets leads to the luxurious MASTER BATH with marble and designer glass surrounds, vanity with double sinks, his & her WCs with bidet, Jacuzzi tub, steam shower and heated floor. The glass tile in the color of a watery green is a refreshing design touch. The north facing guest BEDROOM has a bath with marble surround. The NW corner BEDROOM has a handsome black & white marble bath with pedestal sink & shower. The SW corner BEDROOM is tiled in blue & white with shower over tub. A LAUNDRY ROOM with side-by-side washer & dryer completes this level. A beautiful, wide staircase steps down to the paneled BILLIARD ROOM which features a classic light fixture above the game table. The wine afficionado will appreciate the custom WINE CELLAR which has a 1,000-plus bottle capacity and a handsome polished concrete floor. Temperature control is by BreezeAire. AT-HOME GYM with adjoining spa-like steam shower BATH and SAUNA. The AU PAIR QUARTERS contain a handy sink & bar refrigerator, closet with built-in storage and adjoining tiled BATH with shower over tub. The UTILITY ROOM houses two furnaces with zoned heating, along with an array of systems for fire & security, telephone, computers, audio/visuals and steam shower mechanics. A second washer/dryer set is located under the staircase. A spacious 3-CAR GARAGE completes the lower level. Three security system controls throughout the home. Updated seismic as per 1995 standards. Built-in gas line to patio for barbeque.